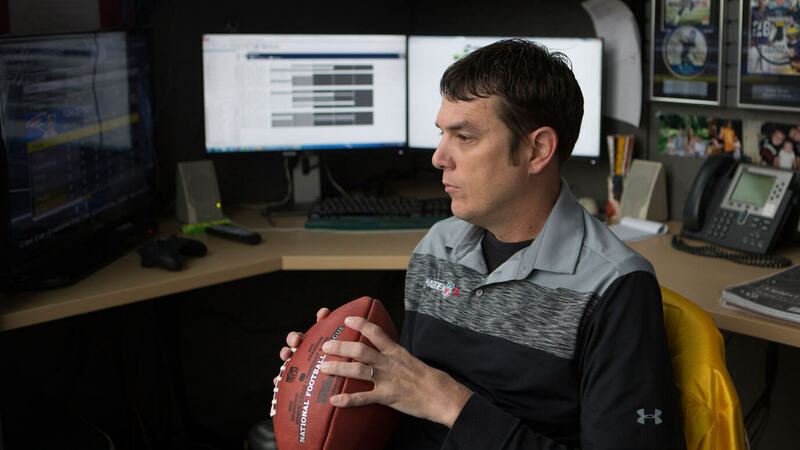 Hunched over a keyboard, surrounded by computer monitors, Donny Moore, 37, controls the fate of the National Football League. Its players throw as hard as Moore wants. They run as fast as he says they should. And the stars of America’s most popular sport aren’t always delighted by his judgments. Carolina Panthers quarterback Cam Newton, for instance, was upset. “I want to talk about my speed,” Moore remembers Newton saying as he clambered into Moore’s cubicle last April. Despite leading all NFL quarterbacks in rushing yards in 2013, Newton ranked as only the ninth-fastest QB in the league, according to Moore — hence Newton’s unhappiness. But as Moore wheeled around from his den of screens, he was confronted by not only Newton, but also an enormous boot on Newton’s foot, the result of recent ankle surgery. Eventually, Newton was pleading with Moore to not make him slower. Such is the power afforded Moore, a hyperactive Floridian who works as the official Ratings Czar1 for EA Sports’ Madden NFL video-game franchise. In that role, Moore is tasked with assigning more than 40 numerical grades to each of the NFL’s roughly 2,600 players,2 evaluating them in categories ranging from passing accuracy to tackling ability. Moore’s process has largely been a black box, and yet it shapes how more than 5 million gamers simulate pro football — particularly because there’s no official alternative to his numbers. A decade after signing a controversial exclusivity deal with the league and the players union, Madden3 is still the only licensed NFL game in town. In fact, an entire culture has grown up around Madden and its attempts to distill human athleticism into numbers. It is all good marketing for EA Sports but also speaks to the sway Madden holds. The ratings are a de facto time capsule from the year they were produced, a digital archive that offers players some measure of immortality in a sport where the average career lasts only a shade over three years. “It’s important to these guys that they be rated 99 in speed; it’s important to somebody that he have the best arm in the game,” Owen S. Good, a writer for the video-game news site Polygon, told me. The allure of the Madden rating might also speak to the relative lack of meaningful statistics in football itself. It would be strange for a baseball player to complain about his ratings in MLB: The Show, for instance, because a realistic baseball simulator (by necessity) has ratings grounded in actual statistics. But in a sport where objective measurements are often inadequate, subjective numbers — like those generated by Moore — take on greater currency. All these factors put more pressure on Moore to produce ratings of ever-increasing accuracy even as they highlight the fundamental paradox limiting Madden’s realism: It’s nearly impossible to accurately simulate some players as long as a gamer must assume control of the athlete’s brain. On the early December day I visited his cramped cubicle, tucked away in a corner of an office building on the EA Sports campus near Orlando, Moore was putting the last touches on a roster update that would be downloaded later in the week by PlayStation and Xbox owners around the globe. When he was finished, 577 players saw some aspect of their skills re-evaluated on the basis of the previous week’s action. It’s an activity that Moore repeats every week of the season in an attempt to ensure that Madden imitates NFL reality. Moore’s ratings elicit all sorts of reactions — anger, joy, pride, ridicule. Here, for example, is a sampling of reactions on Twitter to Tom Brady’s ratings over the last few years. Congrats Tom Brady for grabbing the 100 rating for accuracy in Madden!!! Can't wait! Just lost ALL respect for the madden ratings creators! They got russell wilson the same rating as Tom Brady! GTFOH!!!!! Moore’s employer, Electronic Arts, is the world’s fifth-biggest game publisher by revenue, and Madden is among its most popular titles. The franchise has generated more than $4 billion in revenue since its debut in 1988. Yet for all of EA’s resources, Moore performs his czar duties in surprising solitude. He’s assisted by a former Madden tester who oversees players’ cosmetic details4 and the usual barrage of (ever-civil) feedback on Twitter. But when it comes to the task of managing a database of more than 100,000 player attributes, one of the best-selling sports franchises in gaming history largely leaves matters up to one man. Moore’s job has morphed from a behind-the-scenes technician to a sort of celebrity — and villain — in gaming circles. And in an increasingly data-heavy sports landscape, it’s a role that sits squarely in two intersections of growing importance — between scouting and analytics, simulation and reality. Because in both Madden and the post-“Moneyball” sports world, humans become a collection of data points and then are turned back into a digital approximation of themselves. Translating the athletic skills of flesh-and-blood humans into digital form has been a necessary part of sports gaming as long as real-life players have been incorporated into the software. According to Good, that practice dates at least5 as far back as the 1984 release of “Micro League Baseball” for the Commodore 64. “Micro League” was among the first sports simulations with a license to use Major League Baseball players on team rosters, an innovation that helped usher in the modern era of sports gaming. Developers were suddenly presented with a novel problem: having to represent actual players’ likenesses within the technical constraints of the day. One solution? Assigning numerical skill ratings to help differentiate good players from bad. “They were transitioning from primitive video games that were just trying to approximate the basic acts of a sport,” Good told me, pointing to the Atari 2600’s sports titles as examples of early games without rated players. But with the advent of licensed games, the stakes were raised. “You want Kirk Gibson to play differently from Tony Gwynn,” Good said. But player performance is notoriously more difficult to quantify in football than in baseball. 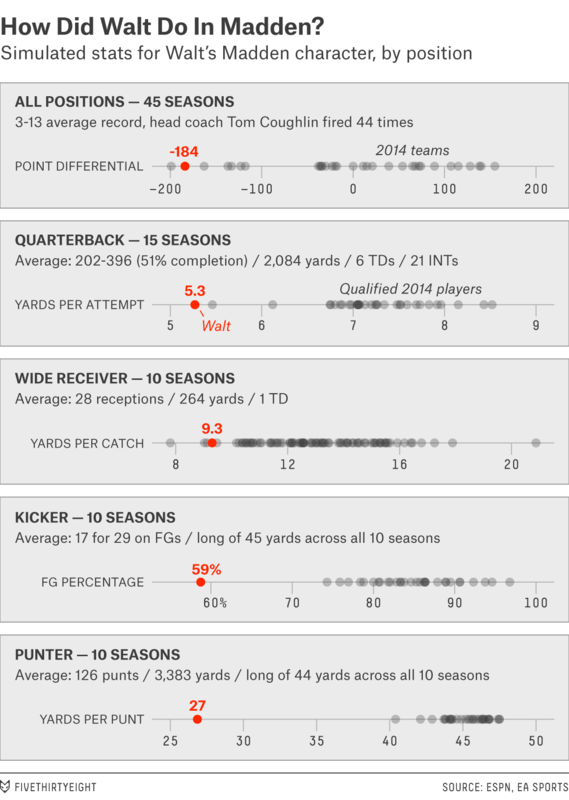 On the gridiron, detailed individual statistics are kept for only a handful of positions, and those numbers frequently miss the whole story because of interactions between 11 players on each side of the ball. 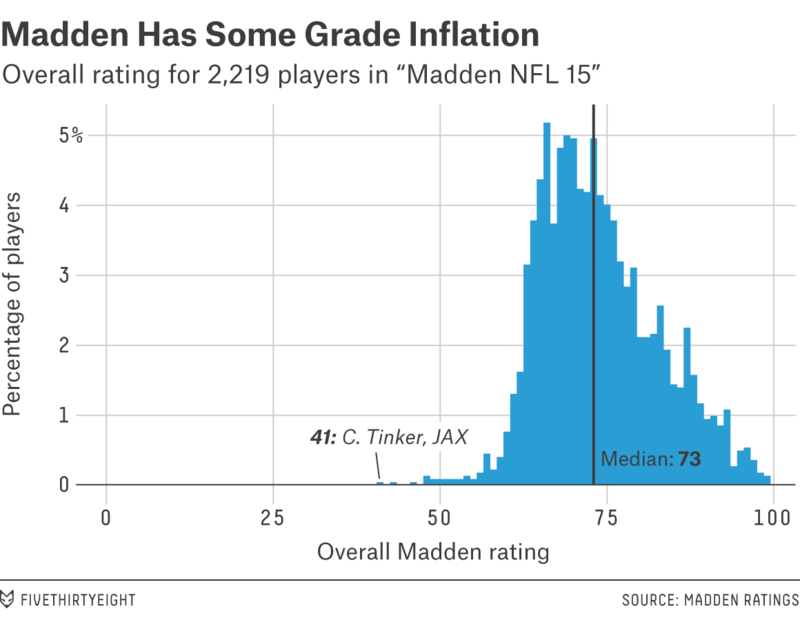 Game developers quickly realized that football players, in contrast with their cousins in baseball, would need to be graded on a wider variety of skills — and that ratings-makers would have to temper the science with a whole lot of art. This did not lend itself to a great deal of differentiation between players. The assortment of skills that needed to be collected for each player grew as football games progressed through the 1990s. By the end of the decade, EA Sports’ NCAA Football series9 assigned 14 attributes to every player in the game,10 while Madden began handing out 17. With the advent of fifth-generation consoles, the degree of complexity in simulating football increased dramatically, requiring a wider range of player attributes to feed into the new game engines. Tecmo Super Bowl Nintendo’s seminal football game was released in 1991 and used no more than seven rating categories for any player. The game wasn’t super realistic. Bo Jackson was an all-time great in the NFL; he was superhuman in Tecmo. 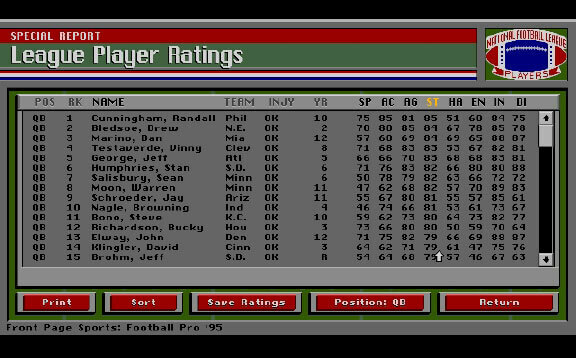 Front Page Sports: Football Pro Sierra Online’s “Front Page Sports: Football Pro,” regarded as the most realistic football simulation of its time, came out in 1993 and had eight ratings. It was against this backdrop that Moore began his professional affiliation with EA. In 1998, he was still a student at the University of Central Florida, pursuing a degree in political science, when in November when he noticed advertisements for an “NCAA Football 99” tournament at the student union. Moore and his roommates were devotees of the game — he recalls elaborate house rules requiring that a witness be present every time a game was played in the friends’ shared Dynasty Mode savefile. On a whim, he skipped class, entered the contest using Florida State as his team, and won first prize. Moore’s detailed knowledge of the game’s minutiae impressed NCAA Football developers on hand for the tournament. On the spot, they offered him a part-time job testing the coming edition of the game, a break he would later parlay into a full-time gig as an EA Sports football tester. Playing and testing the games, Moore got a firsthand look at the give-and-take between gameplay and player ratings. He recalls the time a long-forgotten defensive tackle for the University of Kentucky inadvertently became a superstar after a typo assigned him a speed rating11 of 85 — blazing for a lineman — and when the Oakland Raiders, long known for their real-life fixation on speed, became unstoppable because the Madden game engine translated the overall velocity of the Raiders’ roster into far better virtual performances than the team was capable of in reality. Moore would eventually be promoted to a designer and associate producer along his path to Ratings Czar, but the relationship between Moore’s testing background and his current job is clear. “The [ratings] are probably the single biggest factor in gameplay,” Moore said. And the ratings have far more moving parts now than when Moore began working at EA. 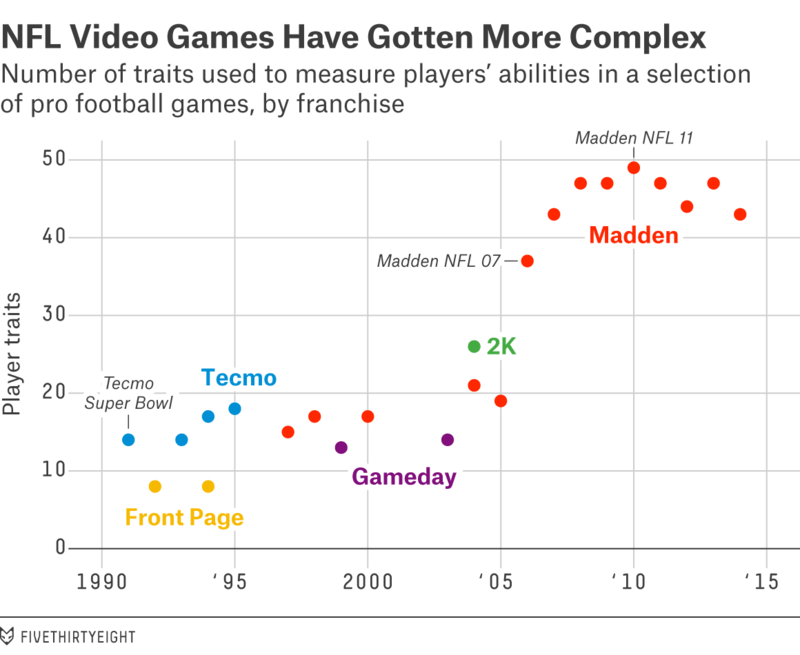 Each player in the game is graded in 43 categories — many of which were added when Madden transitioned from the sixth generation of consoles to the seventh. There are also nearly 20 new player-tendency tags, known as “traits,” that control specific player behaviors. Moore lobbied for many of the new rating categories, spurred by the same motivation that drove “Micro League Baseball” to add player ratings in the first place: greater differentiation among players. When “Madden NFL 15” shipped, the third-year linebacker had an overall rating of 64 and was buried on Denver’s bench. 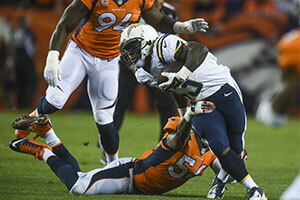 But after an injury to Danny Trevathan in August, Marshall joined the Broncos’ starting lineup. After he put together four straight games with a Pro Football Focus grade of +1.0 or better by midseason, Marshall was rated 75 overall with vastly increased awareness, tackling, zone coverage and play recognition ratings. By Week 14, he carried an 81 overall rating, up a league-high 17 from where he’d started the season. A 75 overall rating for a rookie receiver is nothing to sneeze at, but that was just the beginning for the New York Giants wideout. Beckham recorded 31 catches in his first six games, raising his rating to an 80 overall by Week 11. And in front a national TV audience the next week, he hauled in 10 balls for 146 yards against the Dallas Cowboys — 43 yards of which came on arguably the greatest catch in NFL history. 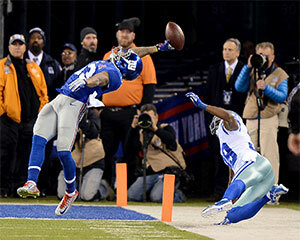 Beckham’s rating would increase by 10 more points, and he ended the year with huge upgrades in awareness, route-running, catching in traffic — and, of course, spectacular catch. That’s why Moore wants to continue adding categories even if it makes his job progressively more daunting. “The developers and programmers hate this,” he said, “but it would be great to do more ratings.” He then launched into an only-half-joking suggestion that the game might add a long-snapping rating someday. For the past few versions of the game, users can download Moore’s latest roster update every week of the season via Xbox Live or the PlayStation Network. That means a player’s ratings fluctuate based on how he plays each time he takes the field. To figure out whose ratings to tweak and by how much, Moore said he combines his observations and notes taken during games13 with subsequent film study, conventional statistics, and — increasingly — advanced metrics from outlets such as Football Outsiders (particularly for schedule strength) and Pro Football Focus. Pulling all that data together, however, is when Moore’s instincts take over. Listening to him describe the process of rating a Madden player across all 43 categories, I began to realize that he has unwittingly adopted a sort of ad hoc Bayesian updating process. He said there’s a bit of “What have you done for me lately?” in the ratings but that certain categories are fundamentally more or less prone to short-term adjustments — another Bayesian-sounding notion. Meanwhile, a category like “spectacular catch” can change on the basis of a single play. Moore defended the policy, saying that this particular rating has little to no effect on actual gameplay — but it underscores the ad hoc nature of some of Moore’s changes. Such modifications will take a veteran player through the end of the season. Moore makes additional adjustments over the summer based on age-related factors and other reports coming out of OTAs and training camps. “In the offseason, I look for guys trending up — young guys — or down — older players,” Moore said. As for the rookies, their creation process dominates Moore’s spring schedule. Starting around March, Moore begins sketching out the ratings framework for projected draftees using a series of templates for each position. Working with measurables from the scouting combine and pro days, he establishes a player’s ratings in categories such as speed and strength, which are almost directly tied to the drills performed by prospects in advance of the NFL draft. For instance, a 4.50-second time in the 40-yard dash will usually earn a prospect a speed rating of 89, barring particularly strong scouting comments about his fleetness of foot (or lack thereof). At the same time, Moore dives into the various public pre-draft scouting reports for each player, marking down pluses and minuses when consistent themes emerge and applying those adjustments to the templates in areas where the raw combine measurables are less useful, such as coverage skills or play recognition. Finally, after all the component categories are set for both rookies and veterans, the numbers are used to generate the fabled Overall Rating. 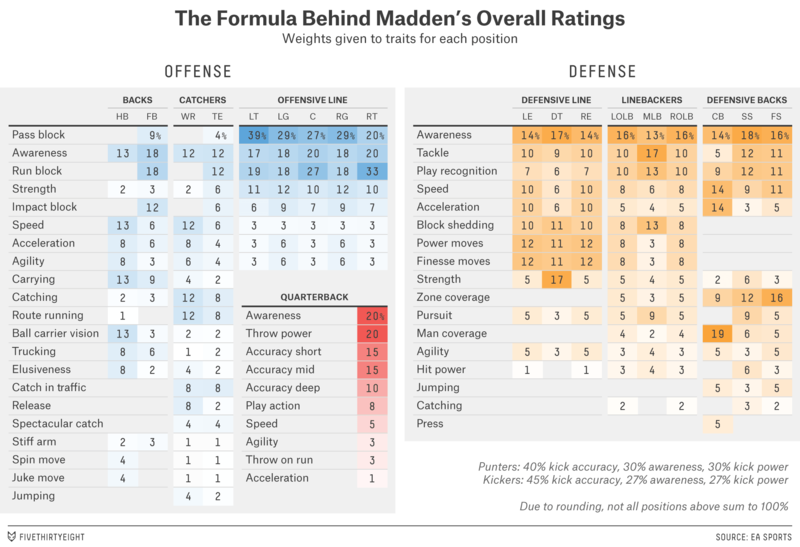 For example, the most heavily weighted categories for quarterbacks in “Madden NFL 15” are awareness and throwing power (each contributes about one-fifth of a quarterback’s overall rating), accuracy by zone (short and medium accuracy are both slightly more valuable than deep accuracy), and play-action passing. Together, those categories make up 89 percent of the overall grade for QBs, with the rest of the weight given to throwing on the run, agility, speed and acceleration. The effects of the ratings on actual gameplay can be arcane for even the most seasoned Madden veterans. Perhaps no one outside of EA Sports has spent more time contemplating Madden’s inner workings than SB Nation’s Jon Bois, the creator of Breaking Madden, a football column that doubles as an absurdist meditation on the game itself. But Bois confessed that he still can’t quite figure out what some of the rating categories actually do for players on the virtual gridiron. “I’ve heard it speculated that even the Madden team themselves don’t really know what’s going on,” Bailey said. Bailey offered an illustration from franchise mode, in which a gamer uses a finite supply of experience points to boost players’ skills. “It can be unclear which ratings you want to increase,” she said. Spending experience points on awareness, for instance, will almost always increase a player’s overall rating — but for defensive players and even quarterbacks, that boost won’t cause them to play better when they’re being controlled in-game. Meanwhile, wide receivers can actually see tangible in-game benefits from a higher awareness score. “I’ve heard it speculated that even the Madden team themselves don’t really know what’s going on,” Bailey said. “Because they’ve got years upon years of systems and code just layered on top of one another, where it’s not always entirely clear how they’re interacting. Whatever the virtues and drawbacks of Madden’s player ratings, though, they’re just a starting point. The game must still be played. Although Madden takes pains to immerse gamers in the fantasy that they are controlling real NFL players, every interaction between two players in the game is also dictated by underlying probabilities, weighted by the various ratings of the respective players. As Rex Dickson, Madden’s creative director, said: “The way the game works on a high level is that when two players run into each other and are about to do an interaction — let's say it's a ball-carrier and a linebacker — it's going to take several ratings and throw them into a formula and do a dice roll. After hours of hearing this kind of talk during our visit to EA’s studios, my colleague Walt Hickey had a realization: This is basically Dungeons & Dragons for sports fans. Yet for all of Madden’s quest for realism, there are certain aspects of football that the game still, and may always, have trouble simulating. On one level, sports video games give regular Joes and Jills the opportunity to perform athletic feats that most could only dream about in real life — blazing runs, high-flying dunks, cannon-armed throws — and games have gotten pretty good at simulating these aspects of what it means to be a professional athlete.17 But sports video games will always struggle to accurately replicate the cerebral side of sports; that’s why it’s more difficult to simulate being Ricky Rubio than LeBron James. There are certain player archetypes that have always been difficult for Madden to accurately simulate. The classic example is Michael Vick from “Madden NFL 2004“; Vick’s speed was overvalued in the game. But less egregious examples occur whenever a gamer takes control of a player whose real-life counterpart possesses immense physical gifts but lacks awareness. The converse is also true; players whose defining skill is football IQ — Peyton Manning and Reggie Wayne, for example — are inept in the hands of an inept gamer. As he is wont to do, Moore suggested the latter could be better simulated with even more ratings or traits. “We could rate if a receiver was on the same wavelength with his QB,” he offered. After all, Moore loves to add to Madden’s stable of ratings. His pet example is passing accuracy, which was originally represented by a single rating but is now broken down into three separate classifications by distance. In previous versions of the game, the single rating was applied to the sureness of every throw, which failed to capture a big part of what makes each quarterback unique. In reality, some QBs have better accuracy on short tosses than deep bombs (think Brady), while others are better at judging long throws than short passes (Joe Flacco comes to mind). By splitting pass types into subcategories, Moore thinks he is better able to represent the characteristics that define different quarterbacks. Moore doesn’t shy away from that critique. “When you make a guy fast in a video game, he’s just a little too effective,” he said. Take receiver Darrius Heyward-Bey, a former track standout who hasn’t exactly had a great NFL career despite ranking among the league’s fastest players. Heyward-Bey is just the kind of one-dimensional speedster whose avatar traditionally wreaks undue havoc in Madden, but Moore insists the revamped ratings have made it more difficult for those players to trick the game’s engine. But while speed can be mitigated, Moore granted that there’s no good way to overcome the problem of simulating a quarterback like Manning, whose most important skills — reading defenses, calling audibles, seeing things on the field that no one else can, and making sound decisions — are instantly negated when a gamer picks up the controller. “Quarterback decision-making is the most difficult thing to simulate,” Moore said. For example, one of the most important categories when computing a quarterback’s overall rating is awareness, which is based on experience and attempts to quantify factors like decision-making and depth of playbook knowledge. Awareness clearly affects how computer-controlled quarterbacks play the game; the lower the rating, the more likely a CPU opponent is to throw into coverage or miss open receivers. But despite its heavy weighting in the overall rating formula, a quarterback’s awareness score makes no difference when a human is controlling him. When you, the gamer, are in charge, it’s up to you to be “aware” for the avatar you’re controlling. So at what point does an unaware Peyton Manning — or an aware Smith — cease to be a true representation of the original? It’s an interesting philosophical issue and one connected to the delicate balancing act of favoring skilled gamers while having virtual players mirror the strengths and weaknesses of their real-life counterparts. “They said to us, ‘Well, if I'm good and making good decisions, I should be able to make good reads and get the pass there,’ ” Dickson continued. “But all of a sudden then you're making guys like Geno Smith look like Peyton Manning, and your stick skills are now superseding the simulation. We've actually had that in the game before, and it didn't go over well. People reject that. It’s a challenge that doesn’t seem to be completely solvable using player ratings, no matter how much faith Moore places in them. Then again, I doubt it will stop him from trying. UPDATE (July 24, 7:15 p.m.): In July 2015, Moore announced his retirement as Madden’s Ratings Czar, leaving EA Sports to join the daily fantasy sports company FanDuel. Madden NFL 16, which will be released in August, will be the final game in the series to contain ratings curated by Moore. CORRECTION (Feb. 25, 1:23 p.m.): A previous version of this article incorrectly characterized Tecmo Super Bowl’s rating system. The game kept 14 rating categories in total, not per player. Neil Paine is a senior sportswriter for FiveThirtyEight. Reuben Fischer-Baum is a visual journalist for FiveThirtyEight. I was on the 50-yard line, trying to make sense of the long slant route ahead of me. My debut was not going well. I was winded, slightly dehydrated and kicking myself after a day of mediocre runs and failed catches. The next pass was my last chance to impress, and I knew the cameras would be on me. When I heard “hike,” I took off. Eight yards out, I saw the ball above in a spiral. I jumped for it pitifully … and hit the ground. The ball was not in my arms. Before that pass, I knew I wasn’t cut out for the NFL. But when it sailed over my head, something else became clear: I was barely cut out for a video-game facsimile of the league. I cannot throw a better pass than that. Yet there was a sort of perverse appeal to the damage I’d bring to the Giants if I were swapped with Manning. What would happen if a schlub like me played in a league as unforgiving as the NFL? Actual participation was out of the question. This is no longer George Plimpton’s NFL. 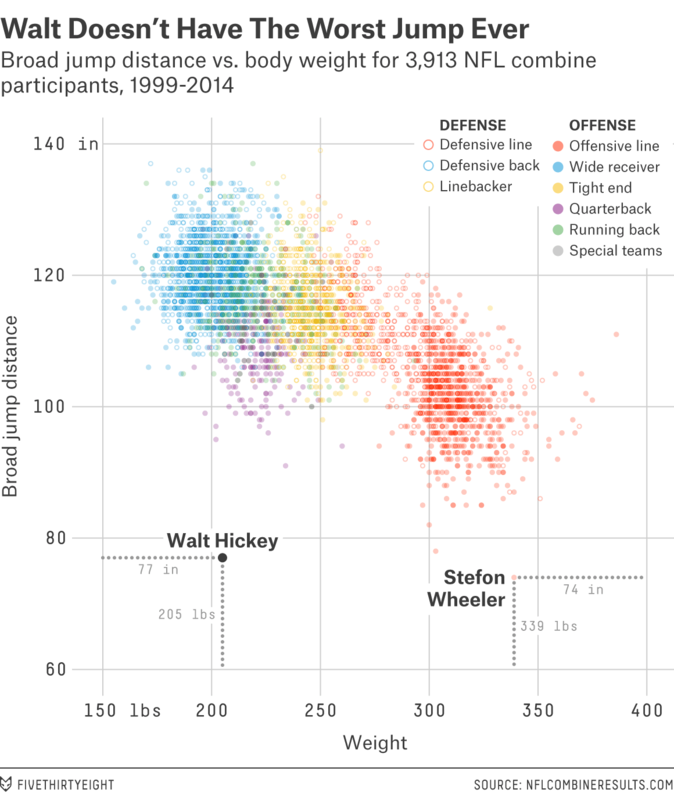 The size of an NFL player has ballooned — players are taller and larger than ever before. 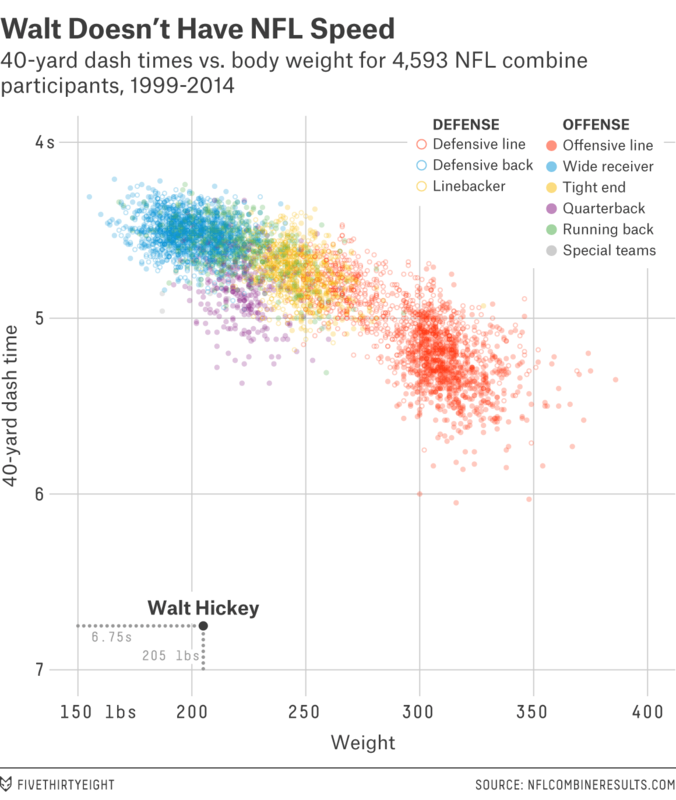 Between 1974 and 1999, rookie offensive linemen got 24 percent heavier. I’m not getting near the turf of an actual football field. Plus, my insurance isn’t that great. But these days, I don’t have to step on the field to know what happens when I step on the field. We have Madden for that. And shockingly, the people behind Madden were willing to turn me into a guinea pig. All I had to do was give them 36 hours and sit in front of a panopticon of cameras, and they’d turn my corporeal self into a digital one. I booked a flight to Florida. The most pressing issue on my mind: what my Madden ratings would be. The game (the most recent edition is “Madden NFL 15”) rates players on a scale from 0 to 99, basing overall scores on 43 categories, including trucking, deep passing, strength and agility. A guy like me was virgin territory for Donny Moore, the Madden Ratings Czar. How exactly would he quantify the football ability of a person with hardly any? That I was essentially a rookie made Moore’s job even harder. As my colleague Neil Paine explained, rookies require an intense amount of research — game tape, college stats, combine performance — because they have no NFL experience to use for a rating. The only way Moore could draw up my forecast was by watching me play. On the agenda: the 40-yard dash, agility drills, and basic throwing and catching evaluations. After that was all over, I figured I’d be one of Jon Bois’s Breaking Madden creations. For the past few years, in a series for SB Nation, Bois has been tweaking players’ stats to show what happens when those players are made superhuman or all too human. I expected to be in the latter category. But I wanted my avatar to at least get a point on the board, at least complete a couple of passes, and at least lead a team to one victory over several simulations (even if I broke an interception record for good measure). I wanted to show that the average dude could survive the rigors of the NFL. I’ve never exactly been an athlete. The last organized sport I attempted was three semesters of club crew in college. I reached out to my former coach, Nathan Walker, to get an independent assessment of my athletic priors. In an email, Walker said he didn’t imagine I was “the type of kid who defined himself through sports while growing up.” That is an understatement. I went to an elite-football high school but ran the debate team. 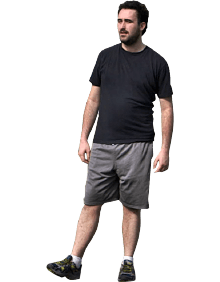 Essentially, like most Americans, I’m not exactly out of shape, but I’m not exactly in shape either. I’m generally just a shape. “You're going to be setting new ground in how low we go with the ratings,” Moore told me on my second day in Florida. But I still had a chance to succeed. In Madden, everything’s a weighted dice roll — one player slamming into another isn’t an athletic act, it’s a probabilistic one. Even bad players like me could get lucky now and then. Take, for example, a player’s trucking score, which captures his ability to run over a defender. Mine ended up being 9 out of 100, which makes me highly unlikely to take on Jadeveon Clowney and prevail. But my interaction with Clowney has an element of randomness — that weighted dice roll could lead to luck for me and misfortune for him, which would mean I’d lower my shoulder and it would somehow push him aside. When I walked on the field to try out for the game, I found this idea oddly comforting. Hickey’s best scores for combine drills. I strolled onto the gridiron in Orlando wearing old gym clothes and the cheapest sneakers available, which I had ordered three days prior. I did the three stretches I remembered from my middle school Presidential Physical Fitness Test — touch your toes, lunge side to side, twist your arm out of its socket — and some light jogging. That may have tired me out more than I expected. My 40-yard dash and 10-yard split times were poor — 6.75 seconds and 2.30 seconds, respectively. Those numbers were a problem because they determined my speed and acceleration grades, which are two of the most important ratings in Madden. No player to participate in the 40-yard dash at the NFL combine since 1999 had a 40-yard time as bad as mine.2 The closest was Regis Crawford, a 316-pound offensive guard out of Arizona State who after the 2004 combine went undrafted. Crawford still managed to run the dash 0.70 seconds faster than me. Then came a lunging jump, in which I posted a consistent 6-foot, 5-inch leap. Moore seemed less appalled than he had all day. “Not bad there,” he said. It was one of the only times I felt anything approaching pride. The quarterback drills brought me back to earth. Asked to throw the ball as far as I could, I threw it pretty consistently between 17 and 20 yards in an often-loose spiral. I then threw the ball toward my colleague Neil Paine, who was trying his hand at receiver, and connected only 40 percent of the time on short, medium and long passes. Watching the drills unfold, Moore said I was throwing the ball too low and would probably end up hitting offensive linemen in the back of the head often. When I had exhausted my arm, I did some receiving drills — or attempted to. I was useless beyond 10 yards but caught each of the three short passes thrown my way. Brad Hilderbrand, a communications specialist for EA, said I could possibly be a great tight end. My pride swelled again. And then it withered the moment my foot touched a football. My range was so pathetic that I couldn’t boot it more than 20 yards, which at least doesn’t preclude me from being one of the league’s great onside kickers. Punting was no better. Any team with me as its punter would go for it on fourth down every time because I couldn’t kick it farther than 11 yards. "Offensive guard is probably your athletic skill set," Moore said at the end of the day. "But you're probably going to want to put on 100 pounds. So, that's going to be hard for you to bulk up there and still maintain the performance that you put on display today." Leaving Orlando, I reflected on the day and felt one thing above all: extreme pain. My back was seizing up, my right arm went somewhat numb, and a nap had only made me more sore. When I got home in the wee-morning hours, I took enough ibuprofen to dull my senses and decided that I should exercise more often.3 The soreness continued for three more days. 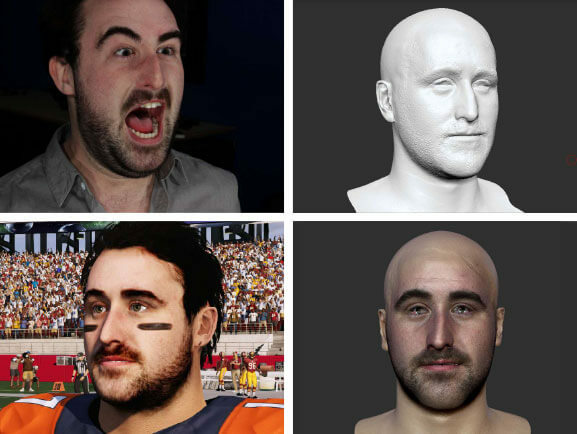 Two months later, Moore and company asked me to return to Florida for the big reveal: what I’d look like as a real (fake), live (artificial) NFL (Madden) player. When I was first in Florida, EA mapped my face for an avatar by putting me in front of 12 high-definition cameras, each poised at a slightly different angle. It looked like what Jeremy Bentham would have made if he had gone into photography after he was tired of designing prisons. I posed seven ways — one mugshot, left and right profile shots, a natural smile,4 one with my mouth slightly open,5 one with a wrinkled forehead and eight chins, and one screaming. When I saw the photos in December, they looked like I had just walked out of an anti-methamphetamine advertisement. The photos came with polarized flashes that stripped my face of any shadow. Zooming in on the high-def shots made it look like I had slept in hot grease. Will Gibson, the technician who took the photos, said they made me look sort of like Ray Romano. When I first met my avatar, it was like staring into a mirror set up across the uncanny valley. My facial features were nearly exact, down to the barely noticeable scar on my chin. But I looked disoriented — even more disoriented than I was on the day of the shoot. My neck lolled; my eyes were glazed over; my blinking was algorithmic. My avatar played just as strangely as it looked. We’re used to playing Madden with athletes who have remarkable skill sets; they move quickly, consistently and responsively. I did not. It was like driving in the snow: You know how the car is supposed to move, but it just doesn’t behave as expected. This is what happens when your Madden score is 12. A 12 out of 100 is bad. Very bad. The lowest-rated player in “Madden NFL 15” is Jacksonville Jaguars long snapper Carson Tinker, who’s a 41. And yet I won some games as quarterback. In the 15 seasons that EA simulated with me as QB for the Giants,6 the team never had a winning season but did win an average of 2.9 games each year. Head coach Tom Coughlin was also fired every season. So, win some, lose some. Moore also simulated me as a receiver, kicker and punter, each of which also dragged the Giants down. The team had an average of 3.3 wins with me as a receiver, 3.5 wins with me at kicker, and 3.8 wins with me at punter. Somehow, I made 95 percent of extra-point attempts, and my average punt was 27 yards. Skeptical, I emailed Moore to see whether the game might be flawed. “It might be one of those things in our simulation where it might not simulate the Extra-Point kicks based off of ratings enough,” he said. Even my achievements may have happened in error. Maybe the only thing causing me to play poorly was that I wasn’t playing as myself. I challenged Madden’s creative director, Rex Dickson, to a scrimmage. 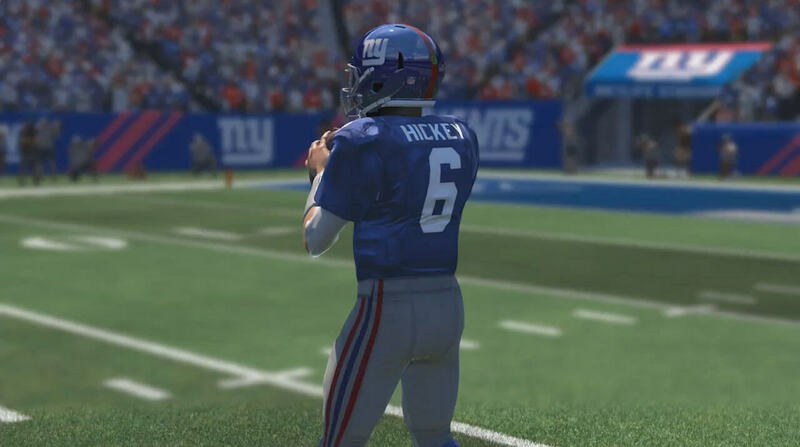 Starting at QB for the Giants: Walt Hickey. Moore looked relieved during the scrimmage. My abysmal performance was proof that Madden really is a simulation of the NFL: A player who somehow lucks into the league without any skills really doesn’t have a chance. He’d have to rely on his teammates to compensate. Thankfully, Madden doesn’t allow for locker-room coups. I will never on my best day be as good as Manning on his worst day. And yet, Madden was way too kind. The Giants should have been so, so much worse with me at the helm. My avatar couldn’t have been rated much lower. I was far closer to a zero rating than I was to the lowest legitimate athlete in the game (Tinker, the long snapper). Despite that, my avatar still managed to lead a team to a little less than three wins a year on average? That doesn’t make sense. The Giants went 6-10 last season. There’s no way Eli Manning is only three wins above Walt Hickey. All we need to do to demonstrate this is to look at the team that performed exactly as I expect mine would: the 2008 Detroit Lions. Although that team was among the worst of all time and failed to win a game, it was made up of talented players who were each still vastly better athletes than I am. Indeed, that year, the overall ratings for four Lions quarterbacks — Daunte Culpepper (80), Jon Kitna (84), Dan Orlovsky (73) and Drew Stanton (77) — vastly exceeded my rating. Factor in my shocking kicking performance (maybe I could make 95 percent of extra-point attempts on, say, the moon or some other low-gravity satellite), and I think that even my low stats fail to encapsulate just how bad (or rather how normal) I am. Madden’s simulation is geared to work within a realm of athleticism where I do not reside. To articulate my actual performance on the field, I’d probably need a negative rating. Despite the praise during practice — that I had more of an offensive-guard skill set, that I could be a tight end, that I was “a real north and south kind of player” — when it comes down to it, I’m clumsy and awkward, my limbs don’t quite go where I want them to go, and at best, it’s just fun to watch me. Generally speaking, I don’t think a regular person could compete with the pros. Most people are somewhat good at something. But greatness — regularly scheduled weekly articulations of greatness — is something that just can’t be turned on. Listen to Walt Hickey and Neil Paine discuss their reporting and how they broke Madden. I asked Moore whether there were any sports that regular people could jump into and be at least a little competitive. “Poker, if you consider that a sport,” he said. Mohegan Sun has a poker tournament at the end of the month. How hard can that be? Walt Hickey is FiveThirtyEight’s lead writer for lifestyle.